(NaturalNews) Most women like to indulge in a nice, relaxing manicure every once in awhile, which doesn’t come as a surprised because, well, let’s face it, who doesn’t enjoy a good neck massage coupled with freshly painted nails? The nail trend is growing trendier, as American women spent a whopping $768 million on nail polish in 2012, according to WWD.com, a number 32 percent higher than the year prior. Unfortunately, we’re beginning to learn that what may seem like an innocent pastime poses more risks than we beauty lovers may have bargained for. 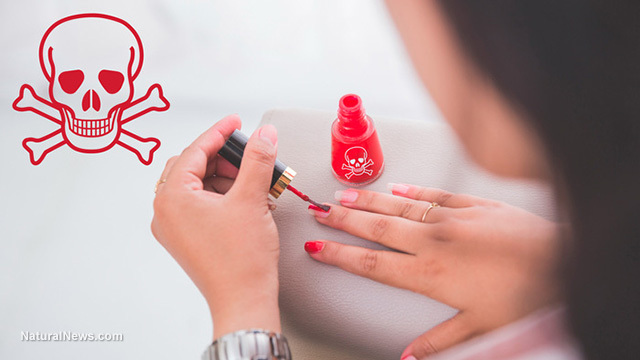 A brand new study conducted jointly by Duke University and the Environmental Working Group (EWG) discovered traces of a rather toxic chemical in the bodies of women who had recently painted their nails. Triphenyl phosphate (TPHP), a plasticizer dually used in nail polish and as a flame retardant for furniture, was detected in the urine of every woman who volunteered to participate in the study. Published October 19 in Environment International, the study involved the testing of ten nail polishes, with scientists finding traces of TPHP in eight of them; two of the eight polishes containing TPHP did not have the ingredient listed on their label. “The results represent compelling evidence that TPHP, a suspected endocrine-disrupting chemical also used in plastics manufacturing and as a fire retardant in foam furniture, enters the human body via nail polish,” says EWG. According to the Centers for Disease Control and Prevention,[PDF] “Repeated exposure [to TPHP] may cause minor changes in the blood enzymes.” Animal studies found that overexposure to TPHP causes muscle weakness and paralysis. For example, when TPHP (also a neurotoxin) was injected into cats, it caused delayed paralysis, with two of six cats becoming paralyzed after 16–18 days upon receiving one “intraperitoneal injection” of the chemical at 0.1 to 0.4 g/kg. 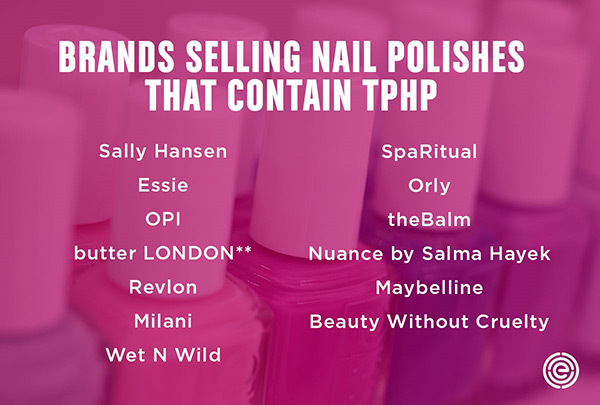 Since researchers tested such a small sample size, and not the manufacturers’ entire nail polish product line, they decided not to disclose which brands contained TPHP; however, the Duke team hopes some or all of the manufacturers will update their product labels to disclose the presence of TPHP pending the results of their recent findings. While researchers didn’t name the culprits by brand, EWG has built an extensive list of cosmetics and the potentially harmful ingredients that they contain, including nail polishes that have TPHP. Some of the top-selling brands containing the endocrine mimicker are featured below. According to EWG, TPHP is likely added to nail polish to give it more flexibility and durability. Attempting to understand how the body absorbs TPHP, researchers asked participants to collect urine samples before and after they applied “a polish that was about 1 percent TPHP by weight. While nails typically aren’t that permeable, scientists speculate that solvents such as nail polish remover allow toxic ingredients to be absorbed into the body more readily. The network of capillaries surrounding the nail bed may also play a role in chemical intake, reports EWG. “Two to six hours after they painted their nails, 24 of the 26 volunteers in the study had slightly elevated levels of DPHP in their urine. Ten to 14 hours after polishing their nails, the DPHP levels in all 26 participants had risen by an average of nearly sevenfold, suggesting that more of the TPHP had entered their bodies and been metabolized into DPHP. “Four volunteers collected urine over 48 hours. For three of the four, their concentrations of DPHP peaked between 10 and 20 hours after painting their nails,” reports EWG. Click here for a list of seven non-toxic nail polish brands. This entry was posted in Health, US News, World News and tagged Endocrine disruptors, Triphenyl phosphate, Cancer, health, Health Issues, Nail polish, Women's Health. Bookmark the permalink.